We’re less than a week away from Valentine’s Day so hearts, love poems, and the color pink are flooding all corners of the web. Most folks will be busy writing romantic notes, taking special holidays, and declaring their love to their significant others. But, the celebration of love and friendship also provides a great opportunity for affiliates to boost their ROI, even if their vertical isn’t the most romantic. Although some industries will find it easier than others, preparing a Valentine’s strategy will allow affiliates to take advantage of all the passion in the online world. That said, even organizations that operate in non-romantic industries can get a huge boost from the right approach to the Feast of Saint Valentine. Let’s take a look at some tips and ad templates that help you build a winning Valentine’s Day strategy for software, gambling, and other non-romantic verticals. Why is Valentine’s Day a Valuable Opportunity for Any Industry? Hmm, but what about the ad format? The Feast of Saint Valentine is celebrated by 53% of people in the US and that number alone represents more than 70 million folks. What’s more, projections suggest that the average person will spend a whopping $221 on gifts in 2019, which should amount to more than $30 billion in total collective spending. After analyzing these statistics, it’s clear that Valentine’s Day poses a great opportunity for all companies. Even people that don’t celebrate this holiday will receive an estimated $9.5 billion in gifts, so there is no reason why you can’t take advantage of this passion-fueled occasion as well! It’s no secret that Valentine’s Day has always benefited some industries more than others. Travel, leisure, and retail are always among the leading verticals, but pretty much all affiliates can win during the festive season and get a hefty traffic boost. Even if you operate in one of the verticals above, you can still create a Valentine’s Day strategy that allows you to benefit from it. There’s no need for a seasonal promotion; you can simply take something you’ve already tried and add a bit of Valentine’s flavor to the mix. Without a doubt, the winning ad format for Valentine’s Day is Push. It proved to be the best, when it comes to event-targeting strategies. Sporting events, sales, and big international holidays like New Year, Christmas, and (ta-da) Valentine’s Day are boosting engagement through the roof. And where are the biggest Push traffic volumes for all these offers? Yes, you got it right – in PropellerAds! And what’s even better – you can fine-tune your targeting settings; you’ll be surprised to see how highly-specific our targeting features are. And now, when you know, where to find awesome Push traffic, let’s get back to business. Just because your vertical isn’t the most glamorous and romantic it doesn’t mean that you can’t get a nice Valentine’s boost. To help you out, we’ve put together a collection of tips and 15 ad templates that help improve your performance on the Feast of Saint Valentine. Copy as it is (not copyrighted, we promise) or get some inspiration from these templates 🙂 Or from these tips. Target gamer couples: Want to add Valentine’s fun? Challenge your second half now! The secret admirer saga: Is your secret admirer late? Kill some time with our game! Payday loans can be used for a variety of reasons, which of course include spending an amazing Valentine’s Day. Find your other half: Want to declare your love? You don’t have to wait for Payday anymore! There is no one more important than you: Show love for yourself – Take out a payday loan and look out for #!1! A Valentine for family and friends: Love for all your folks – Celebrate with friends and family as well! You may think that Forex is among the least romantic industries out there. But, you’ll be surprised to find out how well numbers and statistics related to love and happiness perform. Taking the leap of love: What’s life without risk? In Love and stocks, always take the leap! All players have love for the game, no matter which one they play. Gambling and casinos are no exception, so you should love the player and the game this Valentine’s Day. The more the merrier: Didn’t get a date? Great news, we need an extra player! 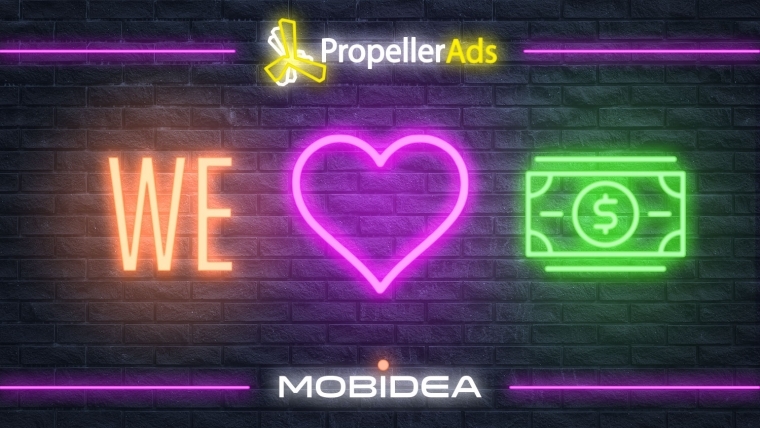 Mobidea put together a list of the best offers to use on your Valentine’s campaigns. If you want to learn more about our network or stay up to date with the best seasonal affiliate strategies, stay tuned to our blog!